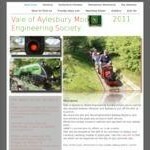 Vale of Aylesbury Model Engineering Society invites you to visit its site situated between Bicester and Aylesbury just off the A41 at Quainton. We share the site with Buckinghamshire Railway Museum and one entrance fee gives you access to both venues. Whilst the railway museum restores and operates full size railway stock VAMES concentrates its efforts on scale models. Visit and be amazed at the skill of our members to design and construct working models of yesteryear.